It’s this passion and smile that has endeared Packers fans to DD over the years. By now you’ve heard that Donald Driver is returning to the Packers on a restructured deal, one more commensurate with what he brings to the table as a 37 y.o. WR. DD is a beloved, life-long Packer that has endeared himself to the fans and community as he has risen from a thought-after 7th rd. 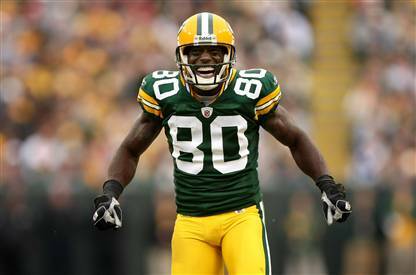 selection in 1999 to become the all-time leading receiver in Packers history. He brings a passion, energy, and smile to the game that fans love. And, he’s the ultimate team player. Needless to say, DD is a player any organization would be lucky to have. Yet, all off-season, it was assumed that he had played his last game with the Packers. There is little debate that DD’s production has fallen off these last few years. After rattling off six-straight 1,000+ yards receiving from 2004 to 2009, his receiving yards dropped to the pedestrian levels of 565 and 445 yards these last two years. As you would guess, his receptions have taken a similar dive over this time frame. Despite this severe drop in production, DD still had a way to make his presence felt at crucial points in the season – most notably in last year’s playoff debacle and this play. The most pressing reason why many assumed his time in a Packers uniform was coming to an end, though, was because of the plethora of intriguing and young talent on the roster. The hierarchy at WR heading into the 2012 season should be: Jennings, Jordy, Jones, and Cobb. (Even though he is only in his second season, the Packers need to give Cobb more playing time ahead of DD. He’s electric, uber-talented, and the future slot WR. Assuming he progresses, he is the better player at this point.) After Cobb, many thought the 5th WR spot would go to the likes of Tori Gurley, Diondre Borel, or even some undrafted free agents from this years crop. After all, TT devoted extra cash to Gurley and Borel on the practice squad to ensure they wouldn’t leave for other teams last season. It’s TT’s mantra to promote from within. This last reason why DD was supposed to be cut is why DD is still a Packer. If you’ve read the quotes from these young players, you can tell that DD brings a lot to the table that cannot be measured by statistics. He is quite simply the leader of the WR core and a great teammate – the opposite of Brett Favre (sorry, I couldn’t resist.) Having veteran leadership on a roster – particularly one as young as the Packers roster – is invaluable. And DD knows, or at least should know, his role on the team. He has never, and likely will never, complain about his playing time or individual stats. He’s a professional in the truest sense of the word and will likely be an important mentor for these young and intriguing prospects. And, frankly, I do not believe DD’s presence on the roster will prevent the Packers from keeping Gurley or Borel as a 6th WR, so long as they prove their worth on special teams – both of which showed some ability in that department last preseason. As a 5th WR, you really couldn’t ask for more if you are a Packers fan. DD is the consummate pro and leader. TT is not keen on keeping players one year too long; but in this instance, TT made the right decision. DD’s value is far beyond his pure statistics and he will be a crucial member of the Packers as they hope to return to the Super Bowl. This entry was posted in Vikes v. Pack and tagged 2012 Green Bay Packers, DD, Diondre Borel, Donald Driver, Donald Driver career stats, Donald Drivers value, Driver statistics, Greg Jennings, James Jones, Jordy Nelson, Packers WR, Randall Cobb, Tori Gurley, TT. Bookmark the permalink.